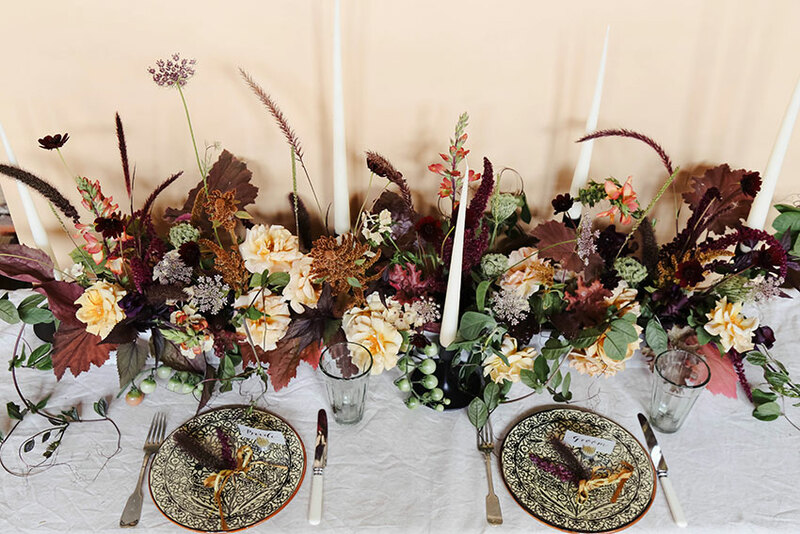 Perfect for a small intimate wedding, a wild naturalistic arrangement running the length of your dinning table created invokes the feeling of a garden border. With bold garden roses, large leaved heucheras, delicate wild carrot and honey coloured phlox nestled in the centres. The rusty browns, deep burgundies and warm golds celebrate the autumn season without looking forced or unnatural. Adding in edible elements such as vine tomatoes creates an interactive element and also brings another dimension to the arrangements. Mixed grasses and tall dainty chocolate cosmos add height and texture without creating a barrier between you and your guests. Adding vines and clusters of garden roses spilling out on the table adds to the wild and natural look, helping to channel that garden feel along the table.